Sterling Hayden led an adventurous, unconventional life that rivaled any cinematic role he played. An actor, author, and seafarer, Hayden extolled the virtues of marijuana, named fellow actors in the Communist witch-hunt of the 1950s, and waged a nasty, highly publicized custody battle for his children. And while he once claimed that he “never knew what the damn hell [he] was doing” on the silver screen, he starred in some of film noir’s greatest offerings, including The Asphalt Jungle (1950) and The Killing (1956). 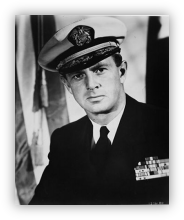 Hayden in uniform as a member of the Office of Strategic Services during World War II. In 1947, Hayden took the matrimonial leap again, this time wedding Betty deNoon, a Pasadena dress designer. The two went on to have four children, Christian, Dana, Gretchen, and Matthew. Career-wise, he appeared in such features as Blaze of Noon (1947), where he played a flying circus family member, El Paso (1949), a western starring John Payne and Gail Russell, and his first film noir, Manhandled (1949). In this rather weak entry in the noir realm, Hayden played an insurance investigator trying to unearth the killer of a wealthy socialite. The film was universally panned by critics, but Hayden rebounded in his next noir, The Asphalt Jungle (1950). Here, Hayden was outstanding as Dix Handley, one of a motley crew of characters assembled to pull an intricately designed jewel heist. Like the best laid plans of mice and men, however, the scheme goes awry – one of the hoods is accidentally shot during the robbery, the leader of the gang is captured by police while trying to flee, and Dix is mortally wounded, dying just as he reaches a farm field in the South he loved. 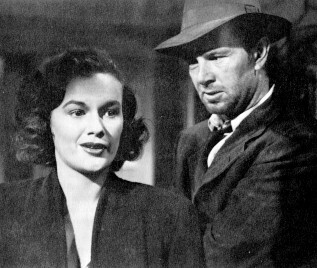 Hayden and Jean Hagen as Dix and Doll in The Asphalt Jungle. 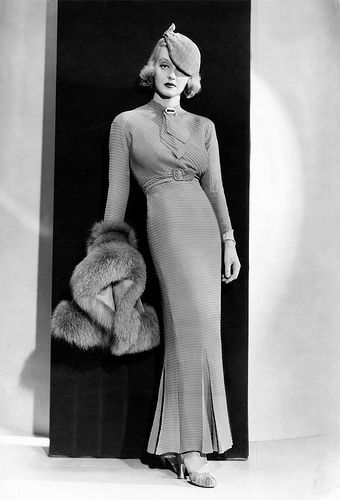 Meanwhile, Hayden was seen in such films as The Star (1952), which starred Bette Davis as a one-time Oscar winner whose career is on the decline; Johnny Guitar (1954), an existential western starring Joan Crawford and Mercedes McCambridge; and two more entries in the film noir cycle, Crime Wave (1954) and Suddenly (1954). In the first, Hayden played a tough-talking, toothpick-chewing cop, and in the second, he was a small-town sheriff determined to stop a planned assassination of the president of the United States. 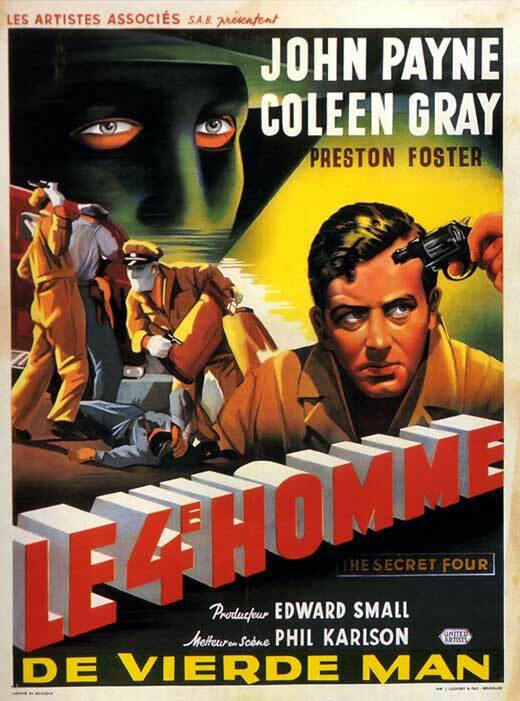 His performance in Crime Wave earned mixed reviews but for Suddenly, he was lauded for his “calm virility and poise” and “authoritative hand[ling]” of the role. Hayden in one of noir's finest, The Killing. 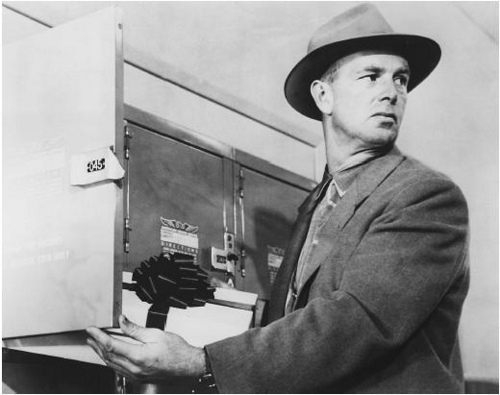 Hayden returned to noir two years later with one of noir’s greatest offerings – The Killing (1956). Like The Asphalt Jungle, The Killing brings together a mixed bag of criminals – an ex-con, a racetrack cashier, a bartender, a cop – for a carefully planned crime. Hayden played Johnny Clay, the ex-con who masterminds the crime, but who lacks a contingency for the double-cross by the cashier’s young wife and her lover. At the film’s end, Johnny almost gets away with the loot from the heist, but in an ironic twist, is forced to watch his ill-gotten gains literally blow away in the wind. Back on the right side of the law, Hayden starred in a late noir entry in 1957, Crime of Passion, playing a police lieutenant whose wife abandons her successful journalism career following her marriage. When the bored housewife – portrayed by Barbara Stanwyck – becomes focused on furthering her husband’s career, she finds herself involved in the “crime of passion” of the film’s title – and it is her husband’s duty to find the killer. 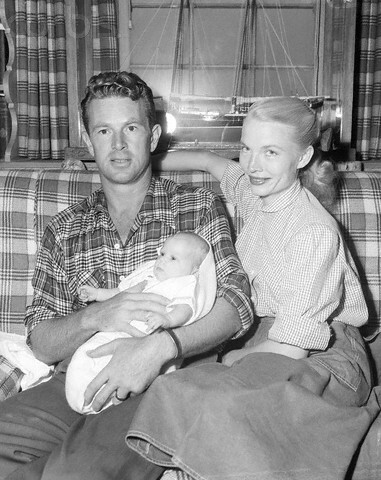 Hayden and Betty deNoon, and their baby daughter. In happier times. While he wasn’t writing or spending time on the Who Knows, Hayden continued to turn in acclaimed performances in such films as Dr. Strangelove or: How I learned to Stop Worrying and Love the Bomb (1964), The Godfather (1972), The Long Goodbye (1973), and Winter Kills (1979), and television features including The Blue and The Gray (1982), in which he played John Brown. In 1972, however, the actor – a longtime heavy drinker – suffered what he termed a “complete breakdown.” It wasn’t until the start of the next decade that Hayden conquered his battle with the bottle, but he frankly reported that he had replaced his drinking with marijuana and hashish. “The main thing right now is to bring the booze under control,” Hayden told a Toronto Sun reporter in 1980. “Grass is all I do now. Grass and hash. Grass came into me and said take it easy. That’s why I love it so much.” Eight months after that interview, Hayden was arrested at the Toronto International Airport after more than an ounce of hashish was found in his luggage by customs officials. The drug possession charges were later dismissed. In 1982, Hayden was the subject of an acclaimed documentary, Pharos of Chaos, which showed his life aboard the Who Knows. The film on the actor’s life was his last appearance on screen. On May 1986, Hayden died following a lengthy battle with cancer. He was survived by his wife, Catherine, and his six children. With his memorable performances in such films noirs as The Asphalt Jungle, The Killing, and Suddenly, Sterling Hayden proved to be one of the era’s archetypal performers. And his adventures – and misadventures – off the screen only made him larger than life. ~ by shadowsandsatin on July 28, 2011. Here is an interview clip of Hayden from 1983 by Philippe Garnier. Notice how he talks about not knowing ANYTHING about acting until he worked with John Huston. Thanks for the clip, Alan! Again: A well written and insightful post. Thanks for your great work! Hayden also turned in an interesting performance in the 1957 film ZERO HOUR, in which he tough-talks Dana Andrews into landing a plane in distress. Offscreen, he lived an incredible life – it would make a great movie! Enjoyed reading your excellent post. Thank you so much for the compliment — I’m glad that you enjoyed reading it. I have never seen Zero Hour — I will have to keep an eye out for it, especially since I am also a Dana Andrews fan. 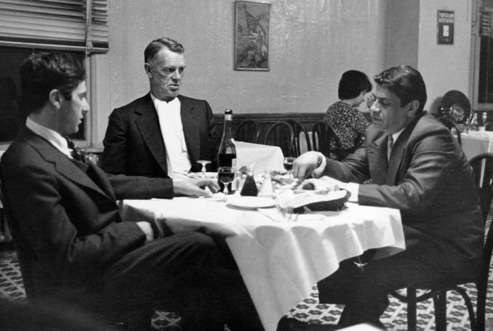 And you’re right about Sterling Hayden’s life making a great movie — wow! airplane was based on zero hour. Yes, I’d heard that! In fact, I taped Zero House about a year ago, with plans to watch it primarily because I’d heard that a lot of Airplane came from it! I need to bump it up on my must see list . . .
Wow. What an insightful post! 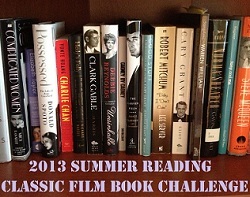 “The Asphalt Jungle” is in THE BOOK, so eventually I’ll be getting to it. As for “The Killing”, I saw it years ago and almost immediately bought it on DVD. I thought it was a fantastic film and honest to God, to this day, I still cite it as one of Kubrick’s best films. A lot like to argue with that, but I stand by that opinion. 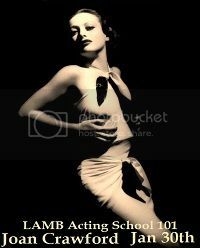 This post also reminded me of the very gorgeous Madeliene Carroll. It’s a shame their marriage disolved, I’m sure they made a handsome couple. Again, great stuff Karen!! Thank you for your kind words, Andrew! I’m with you on your assessment of The Killing — it’s simply outstanding. 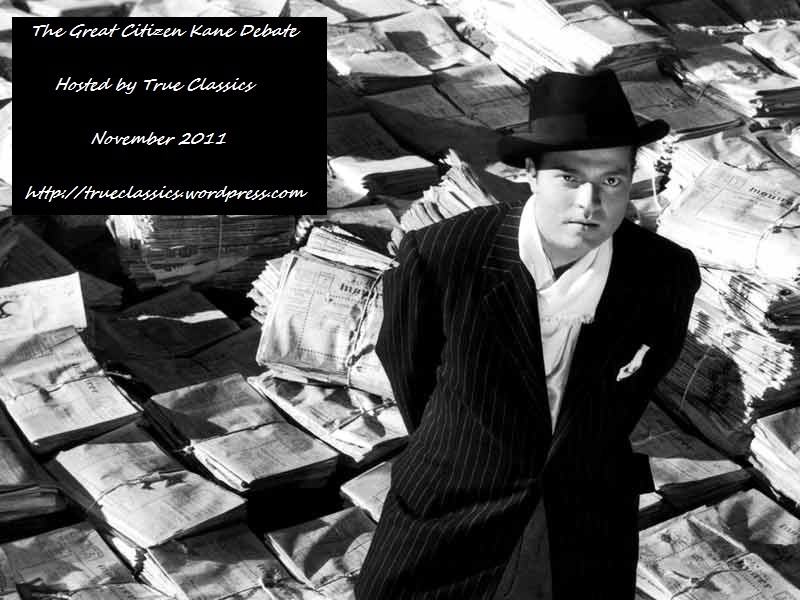 It is one of the noirs I think of first when I list my favorites. No matter how many times I see it, I appreciate its greatness. I totally agree about Asphalt Jungle — plot, characters, dialogue — it’s got it all! Jeff Bridges to play him in a movie.. that would be perfect! What a great idea! I can totally see Jeff Bridges as Sterling Hayden — and what a great movie it would make. Where may one view more of this interview? My mother,a lifelong admirer,still dreams of the day he gave a long glance at her blue eyed blonde MarilynMonroe looks at a Wanderer booksigning. Nick Nolte would be the choice for a bio of him,even now as Hayden older. Hi, Bridget — which interview are you referring to? I took quotes from a number of different sources, and I’d be glad to try to find whichever one you looking for. Nick Nolte as Sterling Hayden — intriguing! A very interesting man who was as tough off screen, as he was onscreen. He was in some great film noirs, especially “The Killing” and “Suddenly”. Unlike John Wayne, he was the true epitome of an All American Hero. Hi, Rob — you’re so right about Hayden’s fascinating off-screen life, and his great noir performances. His story is one of my favorites.